The No. 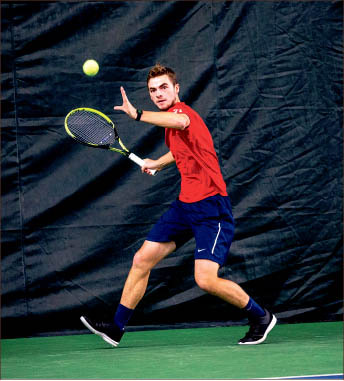 5 seed Liberty Flames men’s tennis team nearly overcame a 3-0 deficit, but came up short losing 4-3 in the semifinal match against top-seeded Coastal Carolina in the Conference Championship tournament April 16 at the Cook Tennis Center. The victory for Coastal Carolina punched its ticket to the Big South Championship. The Chanticleers move to 20-3 on the season, and the Flames concluded the season with an 11-11 record overall. The Flames found themselves down 3-0 after losing the doubles point quickly in the one and two doubles slot. Coastal gained their next two points in the fifth and sixth seeded matches where they handed Liberty a swift defeat in both matches. But with Coastal ahead 3-0 and losing his first set 6-2, freshman Eddie Gutierrez battled his way back into the match capturing the second set 6-4. Gutierrez went back and forth but managed to edge Coastal senior Pedro Leme in the third set 7-6 (7-2) to beat the guy who just a week ago defeated Gutierrez in their April 6 matchup. The Flames needed the players still fighting on courts one, two and four to play big in order to steal victory from the Chanticleers. Junior Sam Matheson was pushed to the brink in the first set in the top singles spot against Coastal junior Jabor Al-Mutawa but pulled out a straight set win 7-5, 6-2. Moments later with the momentum in Liberty’s favor, Liberty sophomore Diego Castano seized victory with the crowd roaring as he scored the match point. Castano took down Chanticleers junior Sebastian Schneider in three sets 7-5, 3-6, 6-2 to knot up the match score at 3-3. The fate of the match swung to Liberty senior Egon Samaai’s court where he battled Coastal junior Vuk Velickovic to decide the match. Samaai won the first set in a close tiebreaker 7-6 (7-4), but dropped the second 6-3. With Flames fans cheering each break on points won and lost, Samaai fought but fell in the third set 6-4 to give Coastal the victory for the match. Although the Flames did not come away with the victory, Johnson had nothing but high praise for his players. Johnson extended a special thanks to the fans for their loud uplifting praise throughout the match. Looking toward next year, Liberty men’s tennis fans have to say goodbye to Samaai, but the rest of the team returns for the 2016 season, along with Matheson who finished this season ranked No. 94 with an 18-1 record on the year. Collier is a sports reporter.